REVIEW: Use the outside world to generate a rich assortment of characters for your art with this DVD guide. This DVD is an invaluable guide that will help artists capture characters and gestures quickly, while not losing any detail in the process. For all the emphasis in art training on how to draw anatomy, the human body manifests itself in an endless variety of forms. And that's without accounting for gender, age, race, personality and style. Capturing such diversity in your artwork is both an opportunity and a challenge. 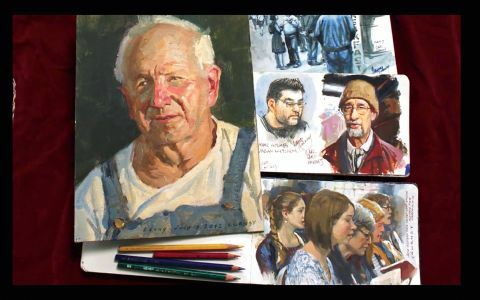 James Gurney's latest video shows him doing the groundwork that supports his successful attempts to represent the breadth of humanity in his illustrations. As with all his In The Wild’ videos, you’ll watch him use an outdoor drawing and painting kit to solve creative challenges. This watercolour sketch comprises people captured at different times as they join and leave a busy queue. There's no guarantee that the subject will retain the same pose or even, in the case of the queue, stay in view until you've finished. James shows you how he adjusts his technique to suit the time he has, focusing in quick studies on gesture and the distinctive elements that suggest character. You'll also see how the situation makes him switch between capturing the subject or the background first; getting values down ahead of colour is a consistent decision. James' In The Wild videos never offer the density of technical advice you'd expect from, say, a Gnomon Workshop video. Instead, they're creative beacons, informing the way you approach your craft and encouraging you to use the world around you to enrich your work. There's also a great deal of enjoyment to be had from the characters that you meet along the way; and the Sacred Harp choir performance, which you'll hear fragments of as James paints, is sensational. This article was originally published in ImagineFX magazine issue 138. Buy it here.